This The Mind review was made after playing the game over 30 times. The Mind is a cooperative limited communication card game in which you’re attempting to play cards in ascending order without sharing any information about your hands. The game was designed by Wolfgang Warsch and is published by Pandasaurus Games. Each game of The Mind is played over a number of levels based on the number of players. You need to get through each of those levels without making a certain number of mistakes. Playing The Mind is really simple. In the first level each player will have one card each and as a team you will try to play those cards in ascending order (there are 100 number cards in the game). You’ll have two cards each in the second level, three each in the third level, and so on. What makes the game tough is that you aren’t allowed to say what’s in your hand, so you have to concentrate and get a feel for how everyone plays. Some rounds will be easier because everyone will have good number separation, but during most levels you’ll have one or more situations where one player’s numbers are within one or two of anyone player’s numbers. Whenever someone plays a card and another player has a lower card, the team loses a life. All of the cards that were lower than the one played are set aside and the game continues. I should point out here that you always have to play your lowest card, so you can’t play a very high card early on to allow everyone to discard a bunch of cards. If you lose your last life, the game ends in a loss. There are also throwing stars. When you use one, each player can discard the lowest card in their hand. You’ll start the game with one throwing star and can gain more as you move through the levels. If you’re able to get through all of the levels, you win! After a win, you have the option of playing in “Blind Mode,” which is the same game except you place cards face down and won’t know if you were successful or not until after everyone has played all of their cards. The Mind is a very unique experience. Sure, its rules are kind of similar to The Game’s rules, but it has a totally different feel to it. The biggest difference is that there is no set turn order in The Mind; it’s all about figuring out what the turn order actually is each round. I love this type of “get in sync” teamwork. It’s a really great feeling when your team is able to successfully play two or three consecutive numbers. Winning always feels good regardless of the game, but that feeling gets elevated a bit when you beat The Mind. It’s probably because every single decision feels like a team decision, so it feels like a real team accomplishment. I think The Mind would have worked without the throwing stars, but I’m glad that they decided to include them. You have a limited amount so as a team you have to figure out when to use them. The majority of my group’s wins happened because of well-timed throwing stars. This game takes up very little table space. It can be played just about anywhere. You can easily teach The Mind to pretty much anyone. I’ve played the game with about 20 people, including kids and non-gamers, and it never took more than a couple of minutes for them to get the hang of it. Play through one level and everyone should be good to go. You never have to worry about quarterbacking / alpha players in this game! The card quality isn’t great. They showed wear pretty quickly. Even though I like playing The Mind as a two-player game, I don’t think it has as much replay value as the three and four-player versions. This is especially true if you play most of your two-player games with the same person. Once you beat it a few times with the same person, the magic starts to fade. Blind Mode isn’t bad, but it’s not nearly as enjoyable as the normal way of playing. The best part of the game is seeing the numbers hit the table and you lose that when playing in Blind Mode. It’s really strange to me that they didn’t make rules for more than four players. 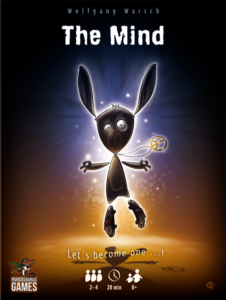 The Mind is one of the most fascinating games I’ve ever played and probably my favorite limited communication game. It’s also my group’s most played game this year. On the surface The Mind is just a simple game about playing cards in ascending order without knowing what everyone has, but the experience is so much more than that. Play multiple games with the same group and chances are you will naturally start to read each other better and have some of those cool moments where you somehow know who has the 58, who has the 59, and who has the 60. It’s weird and it’s awesome. I’ve read and watched quite a few negative reviews for The Mind, so it’s definitely not for everyone. Still, I’d say give it a try to see if it works for your group even if you haven’t liked this type of game in the past. I will probably always have The Mind in my game bag. It’s unique, it’s quick, and I always have a good time playing it. 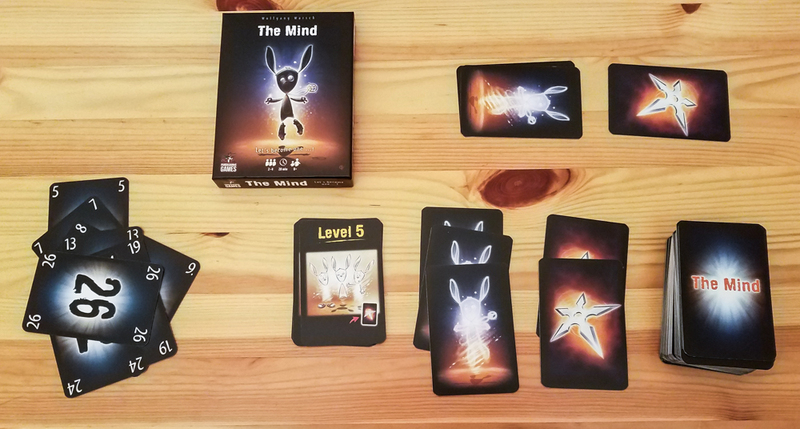 UPDATE: The Mind made it onto our Top 5 Limited Communication Games list! UPDATE #2: It also made it onto our Best Cooperative Board Games of 2018 list! Thanks for taking the time to read our The Mind review! To stay updated on all things cooperative board games, follow us on Twitter, Facebook, or via RSS. I know lots of people say that The Mind is just not a game, but our group really enjoys it. There’s no spiritual connection involved, you can hum and clang a bell if you like but there’s no denying that with a regular group, when played enough you can anticipate how your group would gauge the next card to go down and when you pull it off it’s incredibly satisfying.